Much as I love Turkish food, I have to admit that Turkey’s biscuits have disappointed me. Maybe I’m an English cliché, but I love biscuits and cookies in all their forms (except maybe Rich Teas – just what exactly is the point?). A good dark chocolate digestive with a hot cup of tea for dunking, half a packet of Custard Creams, or a deliciously soft Ben’s Cookie from the Covered Market in Oxford… any will do. But here in Istanbul, finding a good biscuit has been nigh on impossible. Don’t get me wrong. Turkey has a surfeit of delicious sweet treats that are even better than biscuits (exhibit #1 = baklava), but, for me, sometimes only a biscuit will do. I’ve tried Turkish ‘cookies’ (or kurabiye in Turkish), from the patisserie around the corner, but I was sorely disappointed. Kurabiye are small round biscuits, some sweet, some not so sweet, often with raisins, nuts or jam in them. To me, they’re pretty bland and dry – okay with a cup of çay, but otherwise worthless. And so, with friends coming over for tea yesterday, I set out on a mission to bake cookies in Istanbul. 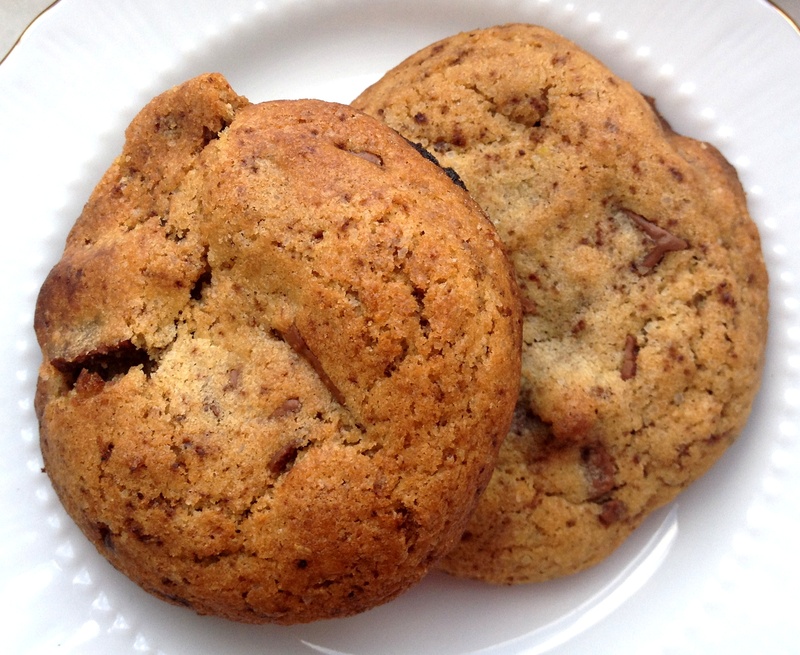 My all-time favourite cookies are chocolate chip – soft in the centre, chewy at the edges and loaded with chocolate. I usually don’t bother with a recipe for these, but I wanted to try out this hallowed recipe from the New York Times – which allegedly shook things up because it calls for the cookie dough to be refrigerated for at least 24 hours. I didn’t have 24 hours and I’m not convinced it’d make a difference – so I came up with the recipe below, a hybrid of past practice and some experimentation from the Guardian’s great chocolate chip cookie article here. Good chocolate is obviously key to a good chocolate chip cookie, but I’ve struggled to find chocolate that I like here – I still find it strange how different multinational brands taste in different countries (Turkish Milka, for example, does not taste good to my English palate). However, I am a HUGE fan of Ülker antep fıstıklı çikolata – good quality milk chocolate with delicious pistachios. I used this here because I didn’t have any other to hand, and I’m highly recommend it! Let me know what you think of these. If you know where I can get a proper cookie or biscuit in Istanbul, I’d be thrilled by any recommendation! Beat the butter and both types of sugar together until the mixture becomes pale golden. Tip in the flour and bicarbonate of soda and stir gently with a spoon until the mixture comes together. Fold in the chocolate chunks and the grated chocolate, then turn the dough out onto a piece of cling film. Wrap up and stick in the fridge for an hour or so. When you’re ready to get started again, preheat oven to 180˚C and line two baking trays with greaseproof paper. Divide the mixture into walnut-sized balls, and place on the baking tray. Press down using two fingers. Make sure your dough balls are evenly spaced out, as they’ll spread during cooking. Place in the middle of the oven and cook until golden and still soft – about 10-12 minutes (this is how I like my cookies – if you like yours drier, cook for a few minutes more). Turn out onto a wire rack to cool, and serve warm. I can’t think of a better combination than chocolate and pistachio. I will definitely give these a try! They’re pretty special! Let me know how you get on. Hope you like them!